Home » News » Holocaust Re-Release Their All Time Classic NWOBHM Album! The re-release of Holocaust’s genre-defining debut LP, The Nightcomers, from 1980 is upon us and with 9 bonus tracks added from the band’s three 12″ singles, also released between 1980-1982, this is an essential purchase for NWOBHM fans and metal fans in general! 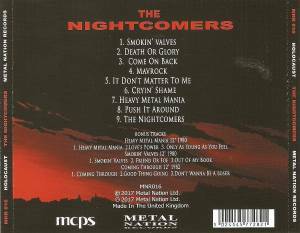 Quite rightly quoted as one of the most important albums of the NWOBHM, this is the first time The Nightcomers has been available on CD for 20 years and with nine bonus tracks added, and a booklet packed with full lyrics and sleeve notes by Holocaust main man John Mortimer, this release will be in high demand by metal fans across the globe. Featuring a multitude of rock anthems beloved by the HM fraternity including “Heavy Metal Mania” and “Death Or Glory” (both songs were also covered in later years by Gamma Ray and Six Feet Under respectively), The Nightcomers features Holocaust’s all original Scottish line-up and was the first release by Edinburgh based Phoenix Records. An utterly essential piece of metal history…..pick a copy up!